Glastonbury is just around the corner and the British festival season is well and truly heating up (both figuratively and literally). Festival goers have exciting preconceived ideas of having the time of their lives, but that will all go to pot if you don’t rock up with an amazing festival tent. Your ideal festival tent will take everything from space and portability, to weather resistance and durability into consideration, and it will ensure that your festival camping experience is a memorable one for all the right reasons. Prepare yourself for every conceivable situation with our comprehensive guide to the best festival tents to get your through this year’s awesome festival season. 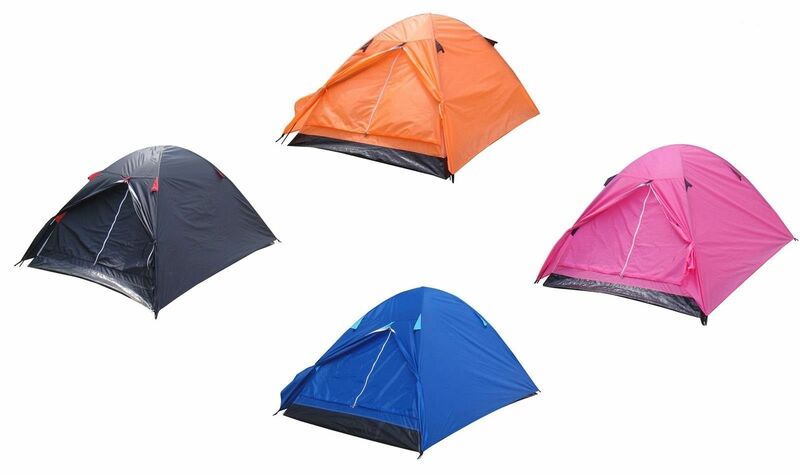 This festival tent is very popular amongst festival goers and retailers who want to offer bargain tents that are just for one-time casual use. 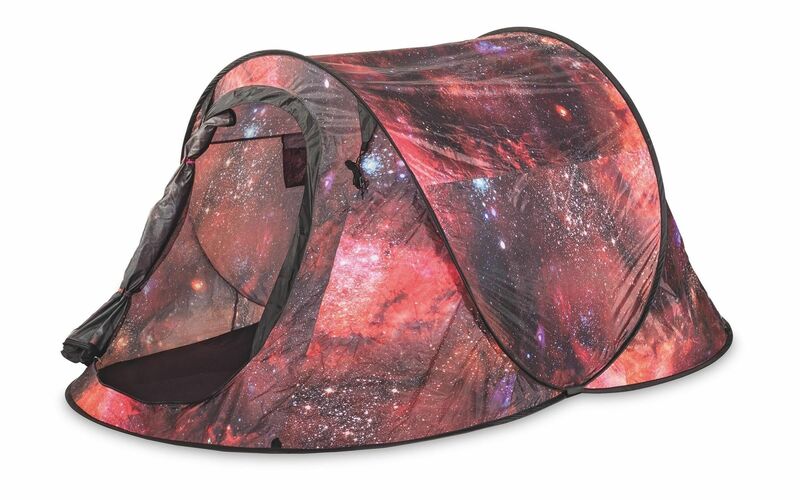 Beautifully bedecked in an awesome starry galaxy design that stands out but doesn’t become an unnecessary eyesore, the Adventuridge Galaxy Tent is extraordinarily cheap in price (retailing at around the £15-£25 mark across numerous outlets) but definitely doesn’t skimp on the design and build quality. 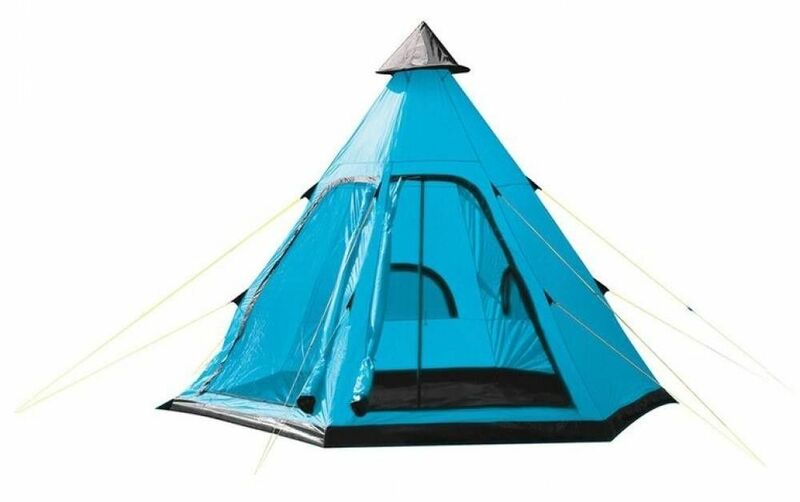 Obviously being a pop-up tent means that you can simply lay the tent down and it will spring into shape, with additional tent pegs to fasten it to the ground. It’s also quite spacious, sleeping two people, though it’s better used as a single berth tent allowing additional room to house belongings. A mosquito mesh door, ventilation windows, large inner pockets and a hydrostatic head of 1000mm make this a multifunctional option that is very suited to short-term use. 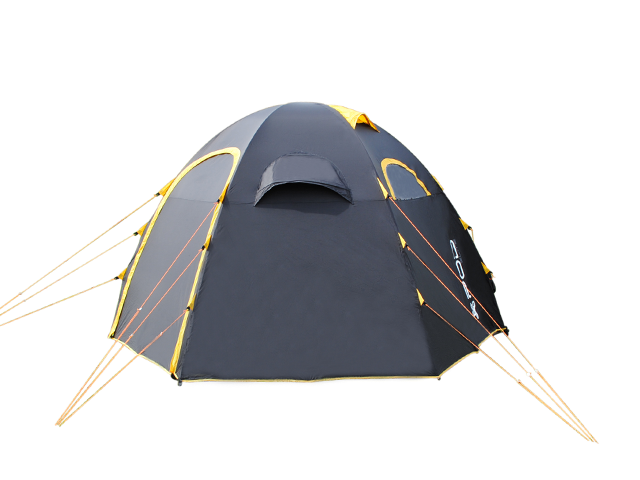 For a few days of intermittent use, this tent is great value for an adequate festival camping experience. For visibility purposes, you can’t really go wrong with a good, brightly-coloured tipi tent. Yellowstone’s fast pitching four-person tent provides standing room for those fussy revellers who want to go through clothes changes in privacy. Given its size, this wigwam-shaped festival tent is surprisingly light and easy to transport. Its distinct shape makes it especially adept at battling the inevitable downpour you’ll likely experience on the British festival scene. Throw in top vents, a sewn-in groundsheet and a free carry bag, this tipi is one of the best festival tents for soggier sites. Distinguishable in its own unique way, the Heimplanet The Cave Tent is an innovative inflatable tent that can be erected in less than 60 seconds. You may not be able to spot it from a mile off amongst the sea of festival tents but this tent has all the glamping hallmarks that the new generation of festival goers appear to be embracing whilst festival camping. Outside, its unique geodesic design offers increased stability and durability, as well as allowing significant run-off when the rain around. You probably won’t need this level of protection for a weekend in Reading, but it’s still great to know it can withstand a bit of rough. 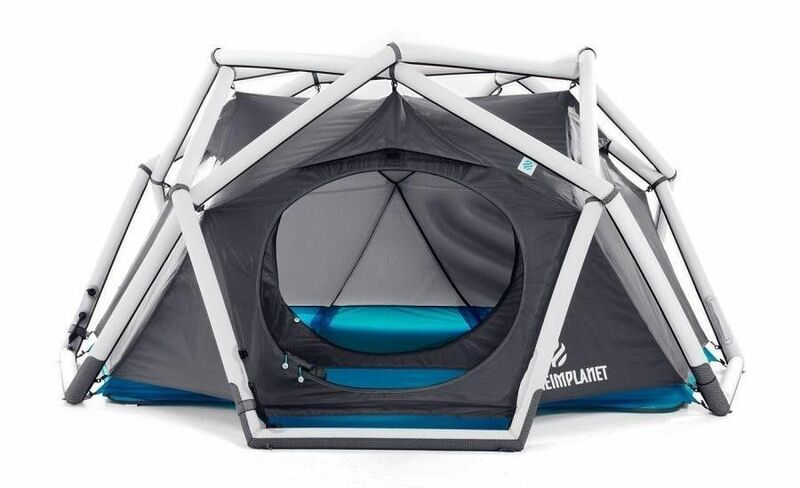 On the inside, separators can dissect the tent into a multi-chamber powerhouse equipped with controllable ventilation, detachable gear loft providing additional storage and a vestibule that allows you to keep your dirty things nearby without bringing them in. On first appearance, this festival tent appears very basic for the amount of change you’d have to dish out to acquire one, but it’s actually got a lot of nifty technology that can be very useful whilst festival camping. Possibly it’s most interesting feature is its unique BlackOut Bedrooms™ system. The BlackOut Bedrooms boast the ability to block out 95% of light which could make the difference between a great night’s sleep and being woken every three seconds by an ominous shadow outside. Additionally, the Blackout Bedrooms™ also use fabric that help to regulate the temperature of the rooms in both warm and cold conditions. Together with the wind responsive fibreglass poles and ventilation system that control air flow inside, this festival tent is a godsend for people who plan on spending a little more time camping than the typical festival goer. And if you have a few friends round and you want to hang out on your lot, the porch complete with windows and an adjustable porch pole allowing users to optimise head height, is a great addition to this festival tent. 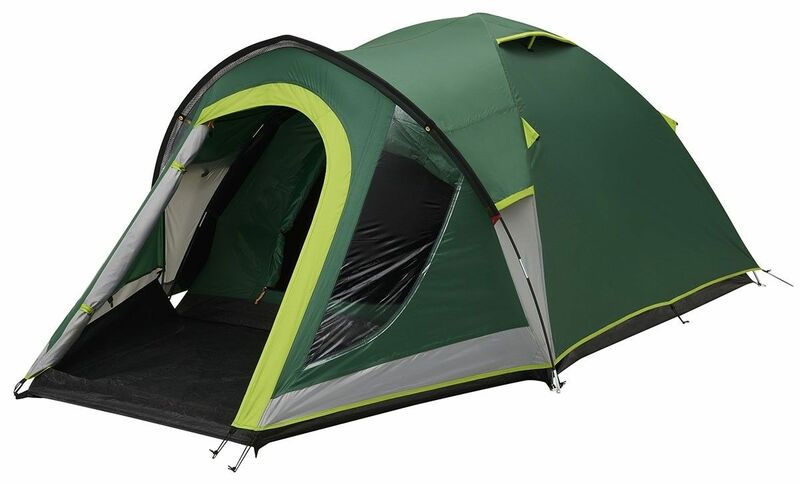 Azuma are well known for making some of the best festival tents specifically for festival camping. With this in mind, they take into account all of the important tribulations campers may encounter and they go out of their way to make sure that they have them covered. Underneath the catalogue of bright, snazzy designs is a double skin construction that is protective without making the tent difficult to transport. At just 1.7kg and packing to a miniscule 56cm (L) x 14cm (W) x 14cm (H), the Two Man Double Skin Dome Tent can be carried – in its handled carry bag – with consummate ease. Equipped all your standard bits and bobs including an outer flysheet, collapsible poles that feel rigid when locked into place, metal tent pegs and a mesh top for ventilation, this is a great budget option. The POD Maxi Elite is a modular tent meaning that it comes as a very basic but liveable unit to begin with, but can be an enhance using a series of add-ons. This feature is especially great if you’re going to a festival with a few of your mates and you want to establish a fun, close-knit community of festival tents that will keep all of you feeling secure. For example, by using the POD Tunnel, the tents interconnect allowing users to gain access to one another without venturing outside – a clever feature for large groups who want to keep socialising throughout. If you don’t plan on rolling up to the festival scene with an entire entourage, rest assured that a single pod has more than enough sleeping room for 8, as well as a height of 2.7m. With a diameter of 5m, you can use the internal divisions to create space for sleep, belongings and a little living space. Just pull up the 8-fingered central attachment to erect the tent and in under half an hour, you’ll be right as festival rain. In many ways, this psychedelic festival tent is a lot like the Azuma offering. But this Emoji Tent focuses on visibility above all. 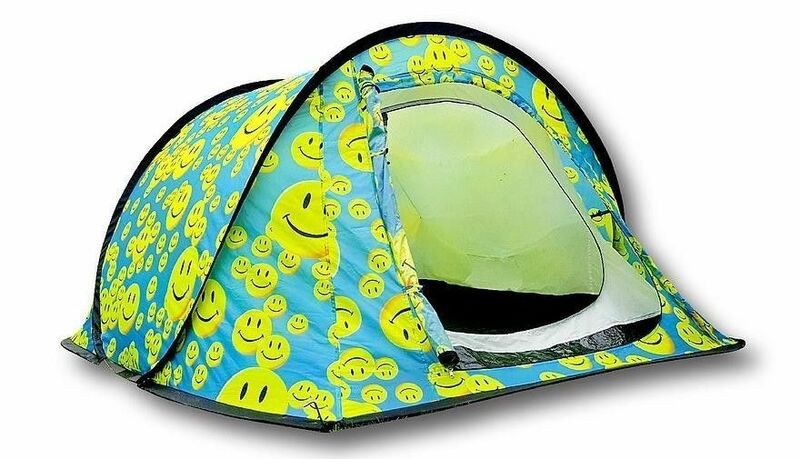 How it does this is using luminescent 190T polyester fabric that makes the smiley emojis glow in the dark. It’s as eerie as it is hypnotic at night but at least you know that you can’t miss it. You will not get a lot of comfort and amenities with this one but everything that should be effortless, is – such as locating it (obviously), portability, quick pitching and water resistance. Though the sweetener is a free Tent Finder (which is really just a fancy word for interior light) and the remote control that switches it on and off from within a 50m range.